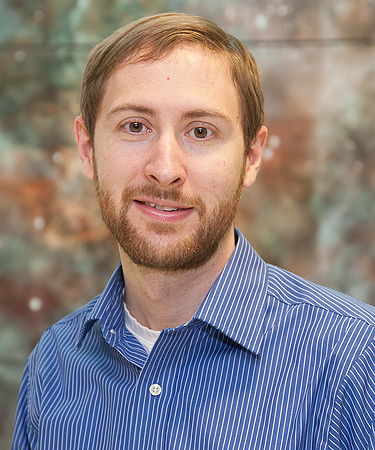 WVU professor Sean McWilliams is part of team who have opened a new window in astronomy. West Virginia University professors Zach Etienne and Sean McWilliams and a group of WVU graduate students are part of a global team of scientists who have detected gravitational waves for the third time, demonstrating that a new window in astronomy has been firmly opened. The Laser Interferometer Gravitational-wave Observatory, or LIGO, made a third detection of ripples in space and time on January 4, which is described in a new paper in the journal Physical Review Letters. The first detection of gravitational waves in 2015 was widely considered to be the most important scientific discovery of the century. The detection provided a new confirmation of Albert Einstein’s Theory of General Relativity, which predicts that space and time are intertwined, and can be made to ripple when orbiting black holes stir them up. These ripples, called gravitational waves, can shrink and stretch anything in their path, although the effect at the Earth is imperceptibly small and very difficult to observe. 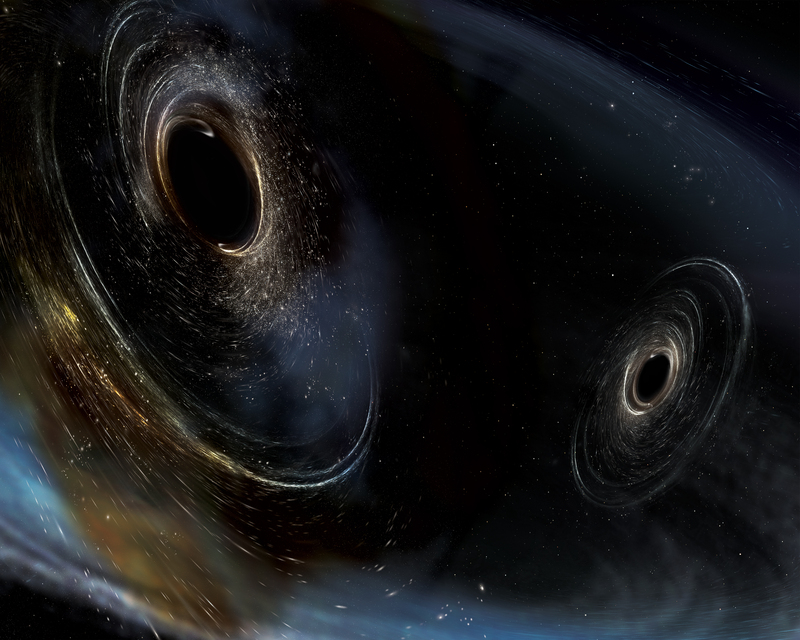 In this new LIGO detection, as was the case with the previous two, gravitational waves were generated when two black holes collided to form a larger black hole. The newly formed black hole had a mass about 50 times that of our Sun, and the collision produced more power than is radiated as light by all the stars in the universe at any given time. Scientists say that the detection further confirms the existence of stellar-mass black holes – those formed by the collapse of a massive star – that are larger than 20 times the mass of our Sun. It also confirms that a new era of scientific discovery is at hand, and with every new detection scientists will learn new information about the universe. Scientists have been able to “see” the universe using telescopes that collect light in its many incarnations. But black holes’ have had a shadowy existence because light cannot escape their gravitational pull. LIGO can “hear” objects like pairs of black holes, revealing even more of the universe than ever before. The LIGO Scientific Collaboration, a body of more than 1,000 international scientists, performed the research with the European-based Virgo Collaboration. The entirety of both groups authored the new paper. The following WVU researchers conducted research on the discovery, are members of the LIGO Scientific Collaboration and are listed as authors on the paper. In addition, the following WVU graduate students also contributed to the work and will be listed as authors on future papers. According to McWilliams, there were four key areas of discovery in this latest detection of gravitational waves. First, the newest observation provides clues about the directions in which the black holes are spinning. As pairs of black holes spiral around each other, they also spin on their own axes—like a pair of ice skaters spinning individually while also circling around each other. Bilgili, Devine, Etienne, Knowles, and McWilliams worked on a waveform model – a type of computer simulation – to study pairs of spinning black holes. The group made significant improvements to an existing model to make it more accurate and efficient. Scientists were able to use the model to measure detailed parameters describing the source of this event, whereas the original version of the model would have been too slow. Using information from the model developed by WVU researchers, for the first time scientists discovered evidence that the black hole spins may not be aligned with the direction of the orbital motion, which has significant implications on the astrophysics of how these systems could have formed. More observations with LIGO are needed to say anything definitive about the spins of black hole pairs, but these first events offer promising clues. Baker and McWilliams also have contributed to improvements of a separate data analysis pipeline. The pipeline takes the noisy data collected by the LIGO detector and processes it to estimate the precise shape of the gravitational wave signal, independent of any preconceived ideas of what those signals should look like. 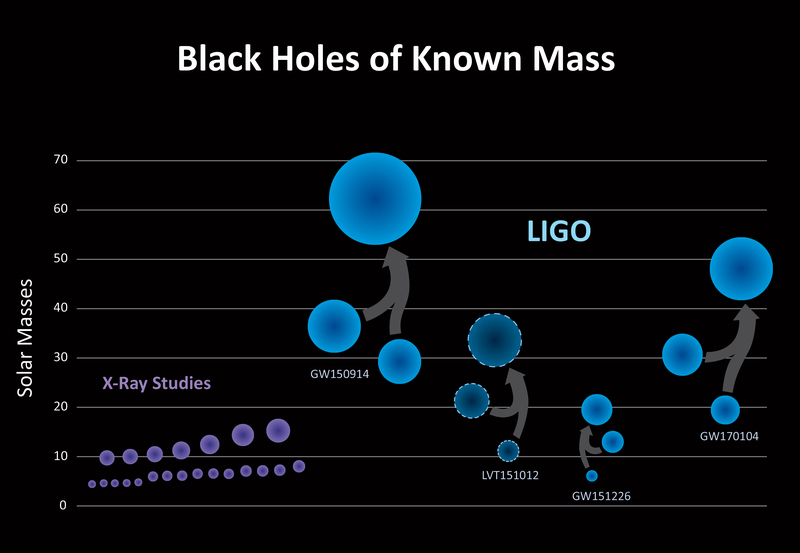 The second area of significance for the latest detection was that the mass of the newly merged black hole was in between the masses of the previous two LIGO detections. At 49 times the mass of our Sun, the newly formed black hole in the third detection is smaller than the first detection (mass of 62 Suns) and larger than the second detection (mass of 21 Suns). The third area of significance is that the most recent detection appears to be the farthest yet, with the two black holes located about 3 billion light-years away. The black holes in the first and second detections are located 1.3 and 1.4 billion light-years away, respectively. The LIGO-Virgo team is continuing to search the latest LIGO data for signs of space-time ripples from the far reaches of the cosmos. The fourth key area of significance was that the new detection occurred during LIGO’s current observing run, which began November 30, 2016, and will continue through the summer. After the first run, the machine was shut down and improvements were made to improve the sensitivity. The global team is also working on technical upgrades for LIGO’s next run, scheduled to begin in late 2018, during which the detectors’ sensitivity will continue to be improved. LIGO is funded by the National Science Foundation and operated by the Massachusetts Institute of Technology and Caltech, which conceived and built the project. Financial support for the Advanced LIGO project was led by NSF with Germany (Max Planck Society), the United Kingdom (Science and Technology Facilities Council) and Australia (Australian Research Council) making significant commitments and contributions to the project. More than 1,000 scientists from around the world participate in the effort through the LIGO Scientific Collaboration, which includes the GEO Collaboration. LIGO partners with the Virgo Collaboration, a consortium including 280 additional scientists throughout Europe supported by the Centre National de la Recherche Scientifique, the Istituto Nazionale di Fisica Nucleare, and Nikhef, as well as Virgo’s host institution, the European Gravitational Observatory. Additional partners are listed at: http://ligo.org/partners.php. © 2019 West Virginia University. WVU is an EEO/Affirmative Action employer — Minority/Female/Disability/Veteran. Last updated on June 12, 2017.